The above quote from one of Chile's best known authors sums up a constant part of our stay in Valparaiso. There are dogs everywhere. Even when inside, we seldom go more than a few minutes without hearing barking from the streets outside. There's little data on the internet regarding Chile's stray dogs, most is anecdotal. The best I've found cites a 2002 study by the University of Chile estimating that approximately 2.5 million stray dogs roam Chile's streets. For perspective, Chile's human population is less than 18 million meaning more than one stray for every ten people. Dogs are everywhere. From Nicole and I's experience, Valparaiso's pooches are incredibly well-behaved and adept at city living. 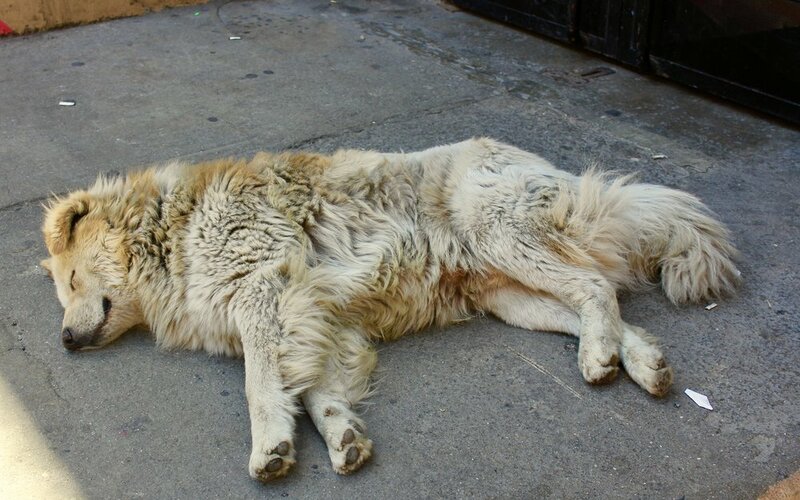 They are friendly to passersby, often paying pedestrians little heed as they lounge on the sidewalks or in alleyways. From our reading, and observations, many of these dogs are partially cared for by locals who leave food and water outside of homes or businesses. But, for the most part, these animals appear to fend for themselves. Cute and friendly as they are, these hardened canines are survivors living a life I would imagine most domesticated pups wouldn't envy.